Put the beanie and a couple pair of old jeans into the washing machine on “hot” cycle, small load, fastest agitation. Add a very small amount of liquid dish washing soap (not dishwasher soap). Let the machine agitate the beanie for 8 minutes. Stop the machine and check the progress of the beanie. If it’s still too big, (I put a shower cap on my head and try it on), reset to the beginning of the wash cycle. Recheck it every 2 minutes. It can felt in a hurry at this stage. Don’t let the washer spin. It takes 16 minutes in my washer. But times vary by machine and water temperature. Remove the hat from the machine and rinse the soap out in a sink. Squeeze as much water out as possible without wringing. Then wrap in a towel to absorb excess water. Then shape it as you desire. You can use a bowl, mannequin head or your own head. Don’t laugh, the first one I made that’s what I did. Now I have the perfect flower pot. Allow the hat to air dry. Trim any loose ends. I would like to make this hat for a large-headed man (size 7 5/8 or 7 3/4). 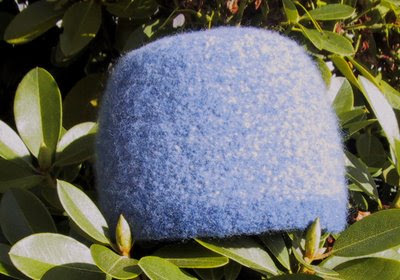 Would you suggest crocheting a larger hat, or would you suggest stopping the felting at an earlier stage? I think you would need to make it larger. I haven't made a larger one so don't have any suggestions as to how large you would need to go. Thanks so much for leaving this pattern. As soon as I saw the picture I said, "That's it!" and to Maggie for the suggestion for making it larger... that was the icing on the cake. Thank you ladies! Did you baste the base of the base bottom to fit better? I made it exactly like the instructions above. Do you mean you make the men's size bigger around but shorter? If I was making it for a man (which I haven't) I would not make it shorter.